I have history with Palmers. A history that predates any heartbreaks, adult milestones, some questionable friendships, and even the internet. A history that cannot be replicated by any other beauty product I've been exposed to. Let me tell you why. I grew up in Phnom Penh, at a time when a lot of western products were not as readily available as they are now. A time when the rest of the world had wifi, and we were still logging onto MSN chat via dial up. No complaints here, #blessed. The first encounter I had with Cocoa oil was when my mom was desperately looking for a solution to her stretch marks, a permanent result of two larger than life pregnancies. I constantly told her it was beautiful and added character; she then would whispere under her breath... "You did this to me". The prevailing advice was cocoa oil among her American expat friends. In Cambodia, this was as hard to find as say, Nerds or WarHeads, both favorites of mine before moving at the age of 8. My mom had my aunt ship Palmers Cocoa Oil to her in bulk from Costco which took months to deliver at a time. That was the only product we used at our household for a long time. The smell of a stringent chocolate mixed with vanilla undertones brings back middle school & high school nostalgia. The humidity mixed with a healthy application of the oils made me reach my peak of supple, Grade A, skin at 16 - a short lived phase as a result of college tequila binges. I thank my mom for introducing this heritage of skincare to me, one I will enforce onto my kids in the future Asian Tiger Mom style. At my age now and being exposed to so many beauty products in general, my body lotions are always changing -- always wanting to try new developments in the industry or the new "it" product. Sticking to just one product for a long time just doesn't happen anymore. I don't know why. Maybe I should go back to the simple days. Life really does come full circle. I could not be more excited to be partnering with Palmers to show you guys their new line of Pure 100% solid Cocoa Butter, Coconut Body Oil and Coconut Body Lotion. Two of my favorite versatile oils I use for my hair, hands, and body. The Coconut body oil itself was very similar to the classic Cocoa Butter Formula Moisturizing w/ Vitamin E, except for a subtle hint of a Coconut aroma. The consistency and the way that my skin soaks it up hasn't changed; it's just like how I remembered it. 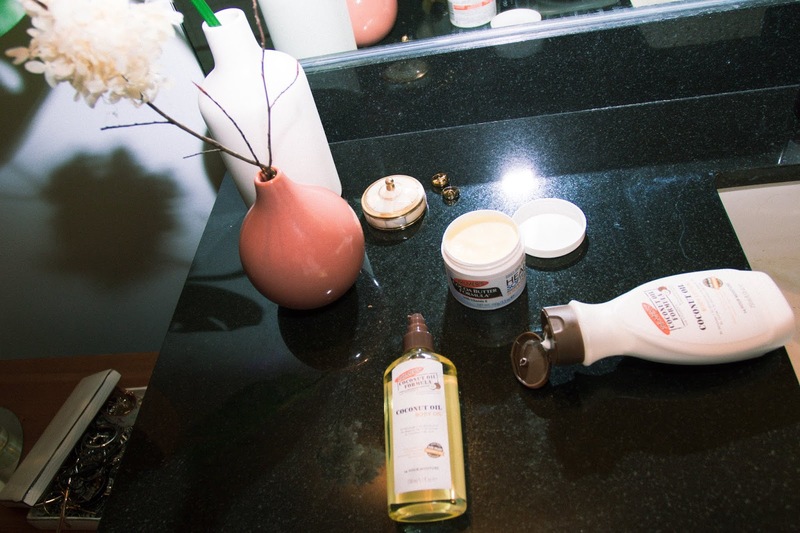 Although I've never tried the Cocoa Butter in solid form, it worked amazing on dry patches such as my elbows, heels, and knees - I found I only needed one application per day to get me through. With all of my partnerships, I make it an innegotiable point to try all of my products to see the results myself and the reliability of the product before writing about it and then translating that experience with my audience. However with Palmers, since it's already been a childhood staple, I really didn't have to. I grew up with Palmers, I know exactly how it works on me. Apologies for the long winded post - I really do love their products lol.